It has been a while. This pause is not due to lack of great local beers to try, but mostly due to a computer crash. Thank you NCIX for the new gaming/blogging rig. There is no shortage of great local beers to try. If you can find it, try the Lighthouse Rhubie ale. Other notable releases I have to review include the double delicious Whooper Swan Impy IPA by Swan's, Mike Doehnel's pilsner by Driftwood and the Canoe/Salt Spring Una Mas release. There are too many releases by Spinnakers to mention. But this article begins with a sad commentary. It appears things might be changing at Vancouver Island Brewing. Those familiar with the industry have mentioned that much of the VIB sales force have left or have been let go. Luckily, Victoria's top Certified Cicerone is still on the job. Hopefully this will not impact their seasonal bomber releases. This is the formula we have come to enjoy in BC craft beer. Have a handful of core brands that pay the bills and release some one off bombers to generate brewery interest. If these bombers taste good and sell well, repeat them. We should be seeing more of the Australian barley wine Numbskull by Lighthouse in the near future. This leads us to the latest release from VIB, the Surf Rider Bohemian Pilsner. 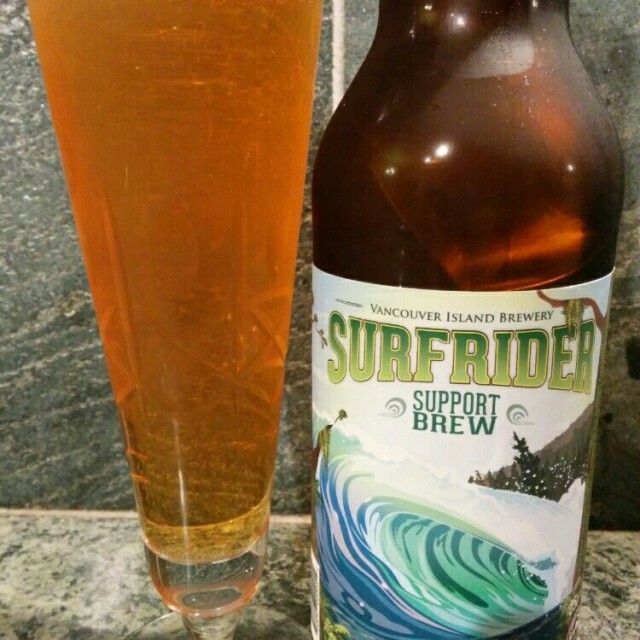 This is donation brew with 25 cents going to the Surfrider Foundation. You all voted for this one; I would have preferred the West Coast Common but such things happen in a democracy. What did the beer prick think about this beer? This is a beer blog so maybe I should try and provide background about this beer style. Of the two old world pilsner styles, this Bohemian style is the maltier and less hoppy variety. By contrast, the German style Pils tends to be drier (more attenuated) and hoppier. This extra hop flavour is enhanced by water that has a higher sulfate content. The Bohemian Pils tends to be richer in malts and more restrained in the hops. This is due to a special barley mashing technique called decoction. Decoction involves changing the temperature of the water used to extract sugars from barley during mashing. Surfrider is a textbook Bohemian pils. The nose is slightly sulfury with cracker malts blended with minor floral and spicy hops. It was unexpectedly hop forward with floral but the chewy honey and cracker malt backbone was not far behind. A slightly mushy linger ended clean; awaiting another sip. Say what you will against the humble pilsner. I would like you try and drink a barrel aged, imperial stout on a warm patio. Appearance +1 Nice label and decent description of what the beer will taste like. Donations to charity are a nice touch. Food Pairings: Will work with most light fair. I'm thinking cucumber and Brie sandwiches. The chewy maltiness always calms spicy Thai food. For those who are bold; they might try a white chocolate fondue.